Welcome to the second post of our App Hacks series. In the last post, we explained how to get your iOS app featured on the Apple App Store. Now, it’s the green robot’s turn. When it comes to distribution, your app competes with 2.2 million Android apps to make its way up to Google Play Store’s golden spots: “Featured Apps”. The goal is to collect various collections and badges, such as Editors’ Choice, Top Developer, Top Charts, Staff Picks, and even Early Access for apps that have yet to be officially launched. 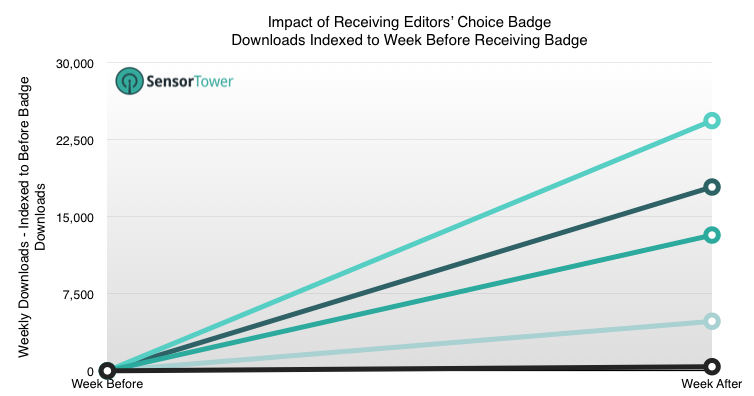 Achieving these can increase your downloads from 4x up to a staggering 24,000x, according to Sensor Tower. Follow these best practices to boost your app’s chances of getting featured on the Google Play Store. A low-quality app will never get featured. Craft your app with polish and make it seamless with all Android devices (tablets, wearables, TVs, etc.). Follow all the essentials that Google lists on their developers website. Even if your app hasn’t built up its ranking yet, Google may still feature it due to its innovative use of Android features. “It’s not bad to do one thing, but do it really really well.” Effective advice from the co-founder of WhatsApp, one of the most successful featured apps of all time. Consider simplicity over feature stacking while building your app. Defining one or two use cases at most in the early versions of your app is ideal to make its function clear. This also maximizes its chances of getting featured. Google releases tons of products each year at Google I/O, such as Firebase and Google Maps SDKs, for developers to make use of them. They want developers to use these tools, and they want to to see them implemented in different apps. Google tends to feature strong apps using these new technologies as a way of validating their own innovations. Make sure to design according to Google’s material design. Support as many Android phones as you can, as GPU hardware differs between devices and that may cause bugs to happen. Try as many store listing experiments as you can right after your launch. With more than one billion active Android users all over the world, localize your app into as many languages as you can. Localizing your app isn’t only about translating it, it’s centered around creating engaging user experiences based on different cultures and seasonal occasions, such as designing a flexible layout to fit certain languages. Make sure to go through this localization checklist. Who is a better person to help you feature your app than someone who leads Google’s mobile efforts in your location? Try to get in touch with your relevant Google Regional Mobile Solutions Lead and ask her to push your app to Google’s partners in the area. This is a very important step to come closer to adding “featured on Google Play” in your app’s description. The secret factor to getting featured is to be noticed by the Google Play editorial team. And the best places to get their attention are on high-traffic industry platforms, such as Product Hunt, TechCrunch, Android Authority, and Android Central. Pitching your app to these sites to cover and scoring media appearances is a proven way to improve your chances of getting featured on Google’s store. One hack to get your app featured in the early weeks after going live is to optimize your launch timing. For instance, if your app depends on a certain specification in a particular phone that will be launched soon, play your launch wisely. A well-known example is ColorNote. Its parent company, Social & Mobile Inc., capitalized on the fact that the Motorola Droid didn’t ship with a built-in note taking app, so they developed ColorNote to be compatible and launched it in sync with the Droid. As phone sales boomed, the app boomed along with it and eventually reached 100M+ downloads. The Google Play editorial team pay attention to user satisfaction before even considering featuring an app. Negative reviews and one-star ratings will definitely harm your app’s reputation and squash your chances of getting your app featured (luckily we’ve discovered the secret weapon to eliminate 80% of negative reviews). So after building your high-quality app and with all of the above, make sure to keep your ratings and reviews high (above four is safe). Be sure not to fall into any of these traps. Explore how Instabug can help you build better iterations of your mobile app and win users’ hearts?